Watt's Up? : Why can’t you put electronic loads in series? The quick answer to the above question is: because you will likely damage at least one of the loads with excessive voltage! For the longer answer, read on…. I’ll start with a brief explanation of what an electronic load is, and what it is used for. I am specifically talking about DC electronic loads here. A DC electronic load is a two-terminal electrical instrument that draws power from a DC source. 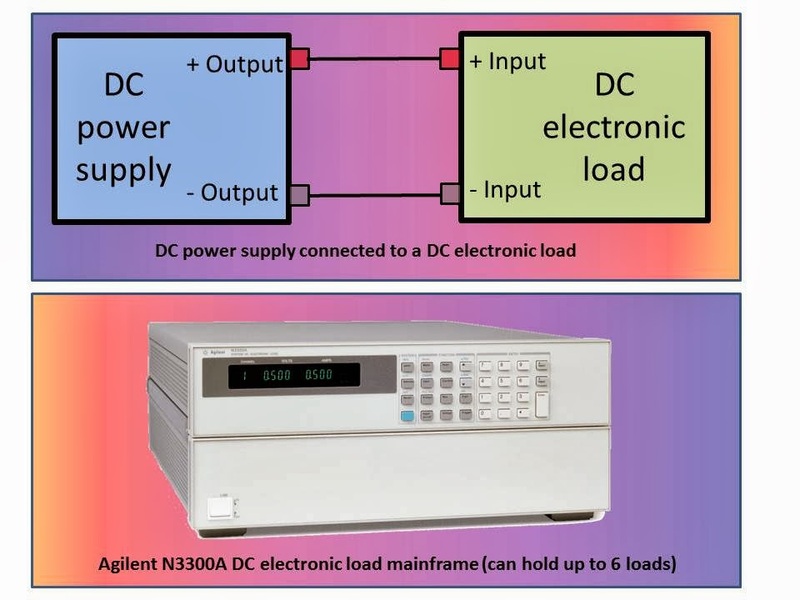 Loads are used to test DC sources. Any device that has a source of DC output power, such as a DC power supply, a DC-to-DC converter, a battery, a fuel cell, or a solar panel, can have power drawn from it with an electronic load. Click here to see Agilent’s DC electronic loads. For example, to test a fixed-output DC power supply that is rated for 20 V, 5 A, 100 W, you would connect the power supply output to an electronic load with ratings that are equal to or greater than the power supply ratings and that can draw a constant current from the power supply. Since the power supply is regulating the voltage (20 V), the load must regulate the current it draws from the power supply (up to 5 A). If your DC power supply is a constant current source, the load must be capable of drawing power while regulating voltage. You can set most electronic loads to draw power by regulating either constant voltage (CV) or constant current (CC). You can also set many electronic loads to regulate constant resistance (CR) across their input terminals, and some can regulate constant power (CP). 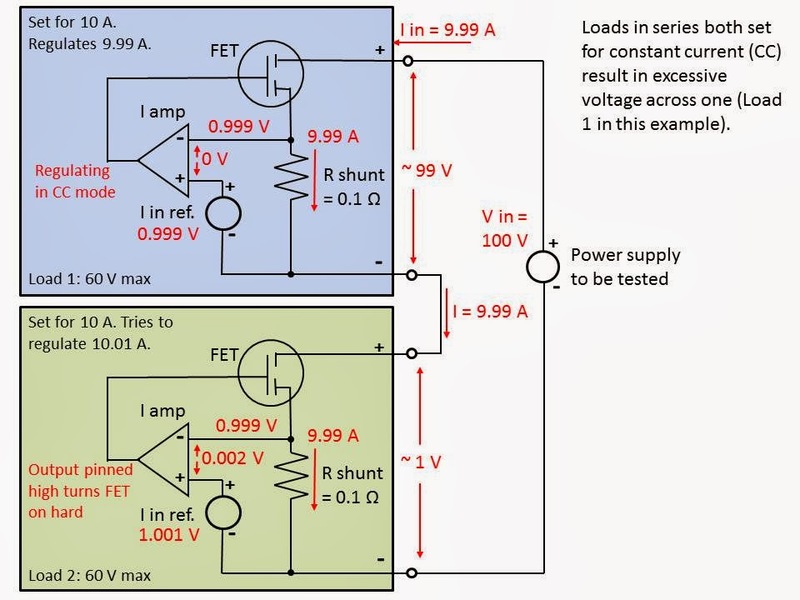 If the power supply to be tested has a higher output voltage than a single electronic load can handle, you may be tempted to put multiple load inputs in series to accommodate the higher voltage. After all, you can do this will power supply outputs to get higher voltage (click here)….why not with loads? Putting electronic loads in series can cause one of the load inputs to be exposed to a voltage beyond its capabilities that could result in damage to the load. You are putting loads in series because a single load does not have a high enough voltage rating to handle the voltage of your DC power source. But since one of the load inputs could become a low impedance (nearly a short circuit) during test, all of the voltage from your DC source could appear across the other load input in series. There are several scenarios that can result in this destructive situation. To understand these scenarios, you first have to understand how an electronic load works. 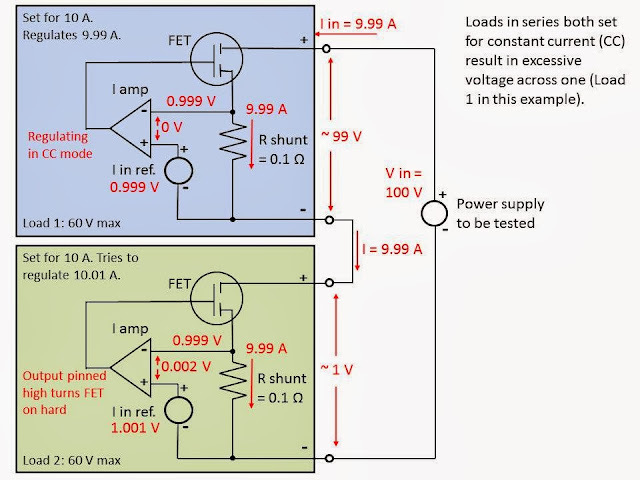 Loads work by controlling the conduction of FETs across their input terminals. The control is realized by using a feedback loop to adjust a measured level (such as the input current) so that it equals a reference level (such as the set current). My colleague, Ed Brorein, posted about this topic last year (click here). When you put multiple electronic loads in series to accommodate higher voltage, one problem scenario occurs when you set both loads to operate in CC mode. You set the same current on both loads. The exact same current flows through both loads (see figure below), but due to small errors in the accuracy of the settings, the real set values will never be exactly equal. Therefore, one of the loads will be trying to draw a higher current (Load 2 in the figure) than the other load (Load 1 in the figure). Since Load 1 will limit the current at the lower value (9.99 A in this example), Load 2 can never attain its real set point (10.01 A in this example). So its internal feedback loop continues to tell the FETs to conduct more and more current until the FETs are fully on looking nearly like a short circuit. This results in nearly all of the power supply voltage appearing across the Load 1 input which can damage it. If you operate one load input in CC and one in CV, at first this looks like it will result in a stable operating point. However you have to think about how you get to that stable operating point. If you set the loads first before you connect the voltage, before the voltage is applied, the CC load is not satisfied (no current is flowing) so it goes to a short and the CV load is also not satisfied (no voltage is present) so it goes to an open. When the test voltage is applied, all of the voltage initially appears across the open CV load and can damage it. There are other procedures to follow that could temporarily result in a stable operating point (such as slowly increasing the test voltage if you have that ability), but if any fault condition occurs in any of the loads, they try to protect themselves by either turning the FETs on hard (a short) or opening the FETs. In either case, the large destructive voltage will appear across one of the loads in the series connection resulting in damage. One of my colleagues, Bob Zollo, wrote an article entitled “Why Can’t You Put Electronic Loads In Series To Get More Voltage?” that appeared in Electronic Design on November 4, 2013. For some additional information about this topic, click here to read the article. So you can see that putting loads in series can too easily result in damage to at least one of the load inputs. I strongly recommend that you do not do it!